In my garden my Rosemary grows several Cyanara cardunculus. These stately (8 to 9 ft tall) thistle-like plants have flowers (above, and cut from today's garden) that resemble thistles and leaves that resemble the leaves of the Acanthus, the plant that the Greeks used as models for their Corinthian column capitals. But Cynara cardunculus is not a thistle it is a close relative of the artichoke or Cynara scolymus. 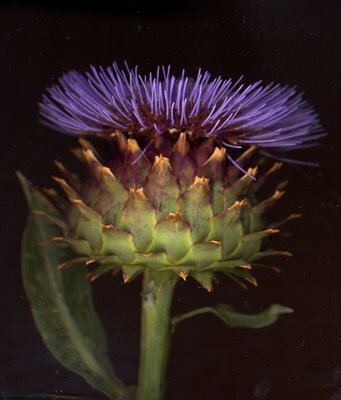 "But the cardoon (Cynara cardunculus) has a far wider range. It occurs in these latitudes on both sides of the Cordillera, across the continent. I saw it unfrequented spots in Chile, Entre Rios[an area North East of Buenos Aires]and the Banda Oriental [modern day Uruguay]. In the latter country alone, very many (probably several hundred) square miles are covered by one mass of these prickly plants and are impenetrable by man or beast. Over the undulating plains, where these great beds ocurr, nothing else can now live." I had not seen my friend Abraham Jedidiah Rogatnick for a couple of months so I called him on Wednesday morning and asked him if he wanted to come over for tea. Abraham at 83 manifests all the impulses of the young man that he is, and said he would be over at four. I sliced a cucumber very thin and soaked the slices in a bowl of water with lots of sea salt and sugar. I made some mayonnaise and put four eggs to boil. In nearby Kerrisdale, at Moore's Bakery, I bought a loaf of white bread, sliced extra thin, for my cucumber and egg salad sandwiches. I also bought some cookies. Rosemary came back from Safeway with very good cherries (I placed them in a bowl with lots of ice) and a watermelon. The secret of my cucumber sandwiches is that I coat one slice of bread with unsalted butter and the other with my homemade mayonnaise. And I always put Coleman's mustard, celery, onion and red pepper in the egg mix. When Abraham promptly arrived I asked him if he wanted organic Tanzania or Earl Grey tea. He opted for the second when I told him that the Tanzania tea was very strong and would help grow more hair on his chest. We went down to the garden and sat down for tea. 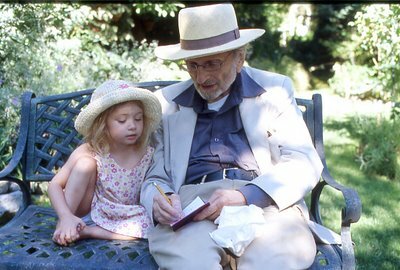 Lauren (4) took a liking for Abraham and sat next to him. She sat closer when I threatened to spit cherry pits at her. 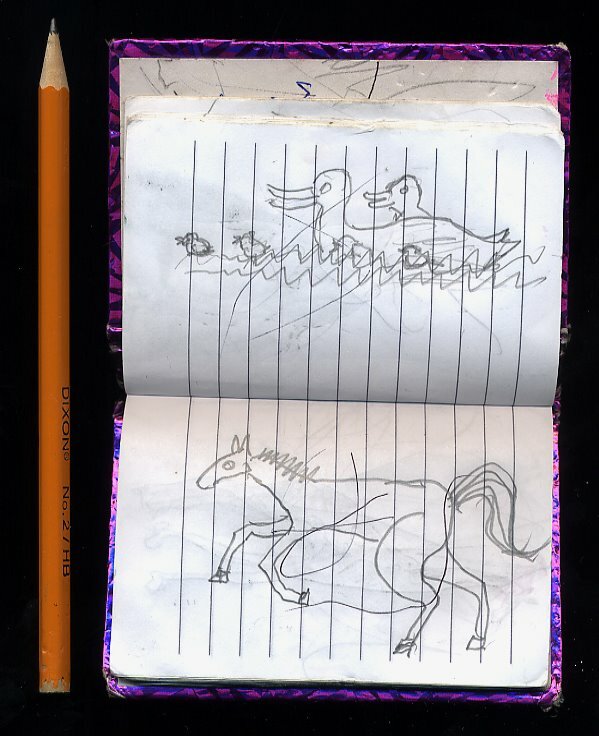 She asked Abraham to draw her a horsie, some ducks, a birdie and a giraffe. This Abraham did. José Verstappen, the executive director of Early Music Vancouver, is the coolest man around. Rain or shine, winter or summer, the man wears socked Birkenstocks. I swear I once saw him walking on 7th Avenue (near EMV's headquarters on Hodson Manor)in shoes because it was raining. Mr. Verstappen refutes my version categorically. 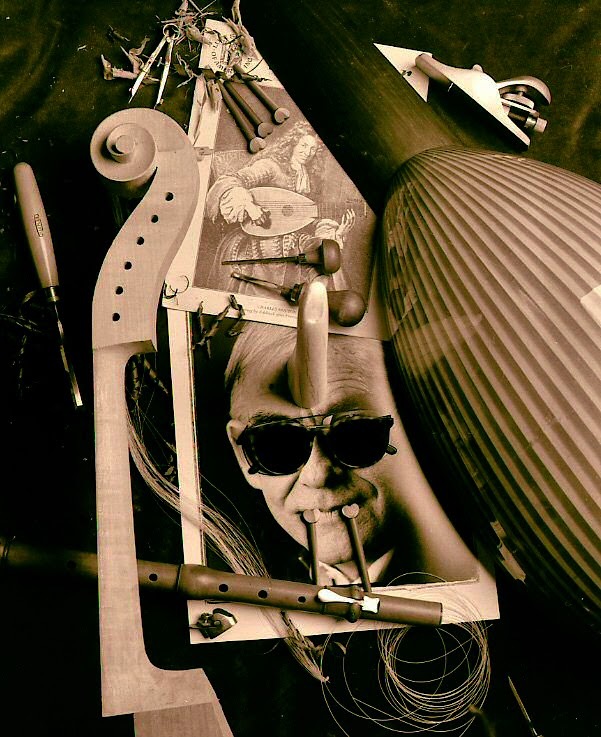 Verstappen, a Renaissance man (he does the web site design, the publicity, the typography, probably vacuums, too) with the help of that other Rennaissance man, Ray Nurse( baritone, lutenist, lute maker, etc) has steered the organization (for 26 years since its founding) into the success that it is today. EMV has brought the best baroque groups from around the world and employed local baroque musicians as teachers and performers in UBC's Vancouver Early Music Programme & Festival. Starting in smaller venues as the much maligned (I loved it!) Metropolitan Tabernacle, EMV can now routinely fill the Chan Centre. But for me, Verstappen has pushed what many consider the normal boundary of the baroque period (the 18th Century) so that through groups like Ray Nurse's La Cetra we are now exploring Bach's early cantatas and listening to composers of the fantastic period of the 17th Century. With the help of local virtuoso violinist Marc Destrubé EMV is also exploring the period immediately after the baroque with performances of Mozart, Hayd, and Beethoven in period instruments. Verstappen, the cool man, has brought us downloadable concert programs with extensive information on what you are going to listen to. His beautiful Early Music Vancouver Calendar (particularly useful as it runs from July of one year to June of he next) graces our fridge with the help of one stout Lee Valley magnet. But best of all EMV promotes the idea that young people should attend concerts. Any adult can bring a youth for free. I wish such organizations as Ballet BC and the VSO adopted similar plans. The paradox, the wonderful paradox, is that thanks to José Verstappen and his EMV when I go to one of their concerts I am magically transported back to the time when this music was exciting and new and had never ever been played before. Late happening adendum courtesy of José Verstappen: I need to indeed refute your comment on me wearing shoes because it was raining; the only occasion I sometimes forget my Birckenstock loyalty is when there is slush after a heavy snowfall. 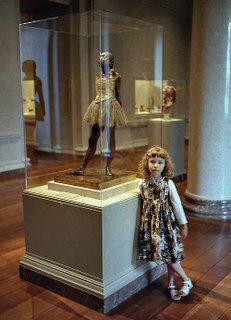 In April 16, 1881 Edgar Degas's wax sculpture of "Little Dancer, Aged 14" was shown in the Sixth Impressionist exhibition in Paris. Paris was in an uproar. Journalists questioned the morality of the little girl and her relationship with the chaste Degas. Newspapers did not name Marie van Goethem (born in 1865 into a Belgian family newly settled in Paris) who stood before them in a real tutu and real ribbons in her real horsehair wig. Marie had been connected with the Paris Opéra Ballet soon after it opened in its new building in 1875. In 1882 Marie was abruptly fired from the Opéra after missing 11 classes and after newspapers cited her as a habitué at the Rat Morte and other dives. Her ultimate fate after 1882 is unknown. In June 2003 I visited the National Gallery in Washington DC and Rebecca posed by one, of the 28 or so posthumous existing bronze casts of the Degas work. Soon after I met Ballet BCs Sandrine Cassini and I was immediately affected by her presence, particularly when she told me she had danced for the Paris Opéra Ballet. Before she left for Europe she posed for me in my studio as an older Marie van Goethem. Every few years the folks at a local art institute have a brilliant idea. They put forward the scheme that they can save lots of money by assigning photography students to take the photographs for the school's brochure and or web page. So students go into a life drawing class and the smell of paint inspires them as does the texture of the charcoal drawings or the oils. 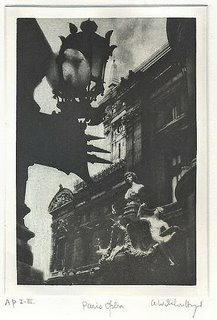 But when these photographs reduce the three dimensions into two, they don't look so exciting and, worst of all, you cannot smell the paint. So for some rare ocasions commercial photographers are hired (I was, twice) to take the photographs. There is a reason why so many of the photographs are disappointing. It has to do with waiting for Henri Cartier-Bresson's decisive moment. Cartier-Bresson had all the time in the world when he sat in Paris cafes with his black-taped Leica under the table ready for the moment. Students have less patience and things just don't happen. 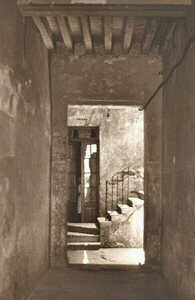 As an example, when I saw this zaguán (passageway) in Mexico City many years ago I was intrigued. So I ran in, rang the bell and ran out and waited. Sometimes decisive moments are created. 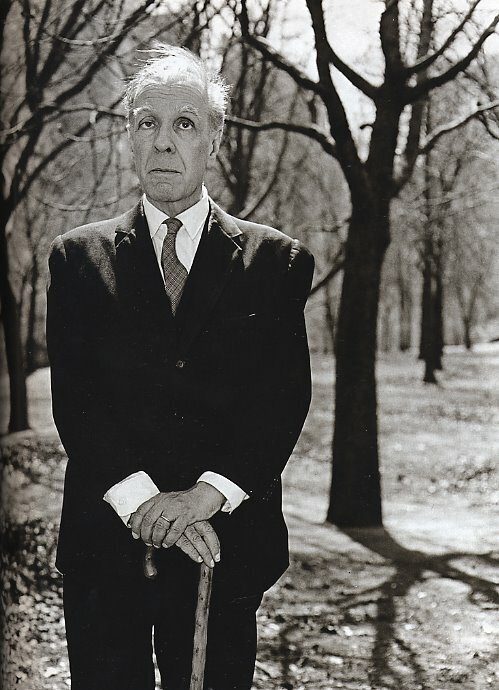 Over the intense chattering of the cicadas I heard Tía Sarita, one hot siesta afternoon of a South American summer in 1952. From my bed, enveloped by a white mosquito net, I heard her whisper to my mother, "Nena, Alex and Wenceslao are almost of age. Next year we'll have them lie with an india so they will become men." When it cooled, we were awakened for cool watermelon. It had been lowered into a well after lunch. I was nine. 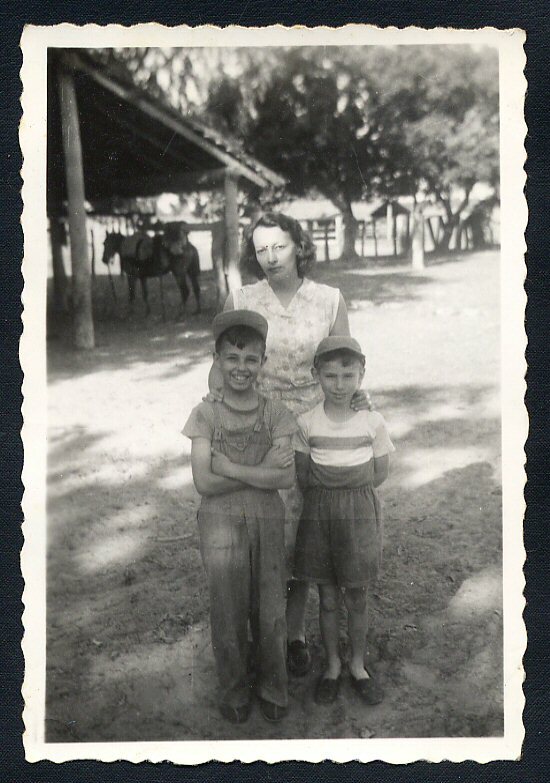 Tia Sarita and my Uncle Tony de Irureta Goyena, with their son Wenceslao, had invited my mother and me to join them on a paddlewheeler, the Guarani, that went up the Paraná River from Buenos Aires to Goya, in the northern, sub-tropical province of Corrientes. From Goya we drove inland at night, to escape the heat, in a flat-bed "Estudevaquer". We were on our backs, the hay beneath us doing little to lessen the bumping of the nonexistent road. Above, the via láctea streaked across the sky, white, like rows and rows of trees that line the boulevards of Buenos Aires, their trunks painted with lime. It was then that I first noticed the Southern Cross. My siesta was in Santa Teresita, an estancia owned by Tia Sarita's widowed aunt Raquel and her spinster sister Abigail. They were always in black, in perpetual mourning for Raquel's Fernando. From the estancia, a day's ride on a horse in any direction marked the boundaries of Raquel's cattle ranch. It was run like a kingdom, hers. Looking back on our daily routine at Santa Teresita I now realize it was anything but that. 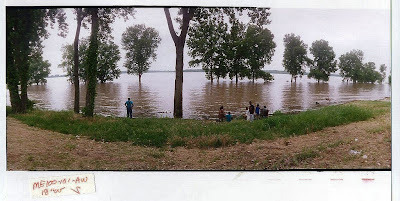 In the morning we swam in the nearby Rio Corrientes, but only after Sixto, the foreman, had splashed around on a horse. The smell of horsflesh allegedly spooked the piraña and the yacarés (alligators) wanting to spoil our fun. Wenceslao (left in photo above with Sarita. I'm the blond one.) and I would often ride in search of the ñandú, the South American cousin of the ostrich. It would have never ocurred to us to eat one nor did we know then that someday the finest wallets and boots could be made from their hide. The swift but dumb bird was killed for its tail feathers which were made into plumeros or dusters exported to the world until vacuum cleaners saved the ñandú from extinction. When we spotted its huge eggs we would gingerly return home with them. The egg, equivalent to a dozen hen's eggs had a very strong smell that Argentines call catinga. Wenceslao and I would place 3 or 4 sheepskins on our matungos (nags) and cinch them up. This and stirrups is the Argentine saddle. We would ride into the pampa where the ñandú would suddenly run from behind the thistles and the cardoons. We would gallop in hot pursuit swinging our boleadoras fashioned from croquet balls and rope. We never did fell one but we knew that behind the thistles, where the bird had emerged , we would find eggs. The peones or workers in the estancia made cakes and milanesas (breaded veal cutlets) with them. 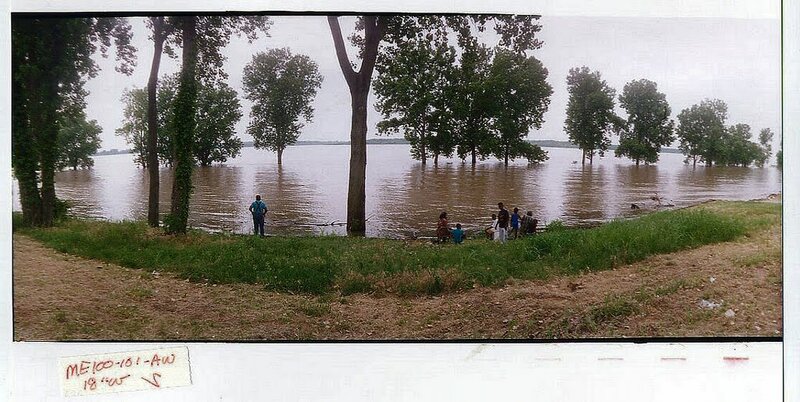 The catinga was so strong we politely rejected all offers. Of all the workers, Sixto spoke the best Spanish. The rest spoke Guaraní, the melodious language of North Eastern Argentina, Paraguay and Southern Brazil. Consider jacarandá, which correctly pronounced, hacarandá, with a stress in that last syllable, may be one of the sweetest sounding words of all. Because of his position, Sixto had the finest facón (knife) and mate gourd. from which he sipped his mate. He owned a pair of boots whose canes were pleated to imitate the bellows of the bandoneón. One day he asked permission to speak to my Uncle Tony. The workers wanted more money and would not work from sunup to sundown until their demand was met. Sixto wanted my uncle to intercede. Tia Raquel was adamant about not caving in. Uncle Tony brought all the workers together. He played some Andean music with his recorder and sang songs in Tagalog. Both my mother and he had been born in Manila. Then, treating them like children, he told them the story of the goose that lay the golden egg in his finest Guaraní . Fascinated, they listened to every word. They dispersed and went back to work. That evening a few cows were slaughtered and an asado was given them by Raquel. Later in the night the workers danced to the Chamamé a Correntino dance. The singing got louder as the effects of the aguardiente took its toll. The next morning Sixto did not ride into the Rio Corrientes. He had been banished for knifing a fellow worker in a fight. The fellow had borrowed his mate without asking. The banishment meant that although Sixto would probably give the authorities a slip he would have to be on the run as a matrero or outlaw. I never did return to lie with an India having to become a man in the more conventional way. But all it takes is an intense summer heat to fondly remember watermelons, Wenceslao and the Southern Cross.